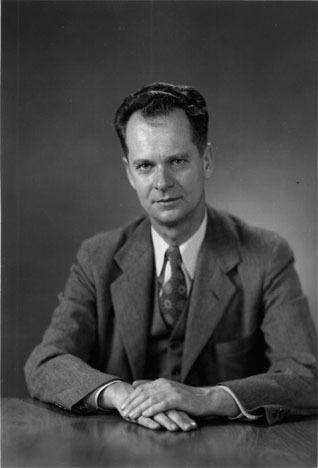 B. F. Skinner was born on March 20, 1904 in Susquehanna, a small railroad town in the hills of Pennsylvania just below Binghamton, New York. With one younger brother, he grew up in a home environment he described as "warm and stable". His father was a rising young lawyer, his mother a housewife. Much of his boyhood was spent building things - for example a cart with steering that worked backwards (by mistake) and a perpetual motion machine (the latter did not work). Other ventures were more successful. He and a friend built a cabin in the woods. For a door to door business selling elderberries, he designed a flotation system to separate ripe from green berries. When working in a shoe store during his high school years, he made a contraption to distribute the "green dust" that helped the broom pick up dirt. In high school, Skinner took an English class taught by Miss Graves to whom he was later to dedicate his book, The Technology of Teaching. Based on a remark by his father, he blurted out in class one day that Shakespeare had not written As You Like It, but rather Frances Bacon. When his teacher told him he didn't know what he was talking about, he went to the library and read quite a bit of Bacon's works. Bacon's championing of the inductive method in science against the appeal to authority was to serve him well later. After attending Hamilton college, Skinner decided to become a writer. Moving back home he wrote little. His entire production from the period he called his "dark year" consisted of a dozen short newspaper articles and a few models of sailing ships. Escaping to New York City for a few months working as a bookstore clerk, he happened upon books by Pavlov and Watson. He found them impressive and exciting and wanted to learn more. At the age of 24 Skinner enrolled in the Psychology Department of Harvard University. Still rebellious and impatient with what he considered unintelligent ideas, Skinner found a mentor equally caustic and hard-driving. William Crozier was the chair of a new department of Physiology. Crozier fervently adhered to a program of studying the behavior of "the animal as a whole" without appealing, as the psychologists did, to processes going on inside. That exactly matched Skinner's goal of relating behavior to experimental conditions. The student was encouraged to experiment. Each department, Psychology, and Physiology, assumed the other was supervising the young student, but the fact was he was "doing exactly as I pleased". With his enthusiasm and talent for building new equipment, Skinner constructed apparatus after apparatus as his rats' behavior suggested changes. After a dozen pieces of apparatus and some lucky accidents (described in his "A Case History in Scientific Method"), Skinner invented the cumulative recorder, a mechanical device that recorded every response as an upward movement of a horizontally moving line. The slope showed rate of responding. This recorder revealed the impact of the contingencies over responding. Skinner discovered that the rate with which the rat pressed the bar depended not on any preceding stimulus (as Watson and Pavlov had insisted), but on what followed the bar presses. This was new indeed. Unlike the reflexes that Pavlov had studied, this kind of behavior operated on the environment and was controlled by its effects. Skinner named it operant behavior. The process of arranging the contingencies of reinforcement responsible for producing this new kind of behavior he called operant conditioning. Because of a fellowship, Skinner was able to spend his next five years investigating not only the effect of following consequences and the schedules on which they were delivered, but also how prior stimuli gained control over behavior-consequence relationships with which they were paired. These studies eventually appeared in his first book, The Behavior of Organisms (1938). In 1936, then 32 years old, Skinner married Yvonne Blue and the couple moved to Minnesota where Skinner had his first teaching job. Busy with teaching and his new family that in 1938 included a daughter, Julie, he did little to advance the science he had started. But that was to change with the war. In 1944 World War II was in full swing. Airplanes and bombs were common, but there were no missile guidance systems. Anxious to help, Skinner sought funding for a top secret project to train pigeons to guide bombs. Working intently, he trained pigeons to keep pecking a target that would hold a missile onto a target. The pigeons pecked reliably, even when falling rapidly and working with warlike noise all around them. While Project Pigeon was discontinued (because of another top secret project unknown to Skinner - radar), the work was useful. Pigeons behave more rapidly than rats, allowing more rapid discoveries of the effect of new contingencies. As Skinner put it, "the research that I described in The Behavior of Organisms appeared in a new light. It was no longer merely an experimental analysis. It had given rise to a technology." Skinner never again worked with rats. Skinner described Project Pigeon in an article with the same name. The article is in Cumulative Record. In 1943, towards the end of the Minnesota years, Yvonne was pregnant again. Knowing of her husband's talent at solving problems with gadgets, she wondered whether he might design a crib that would be safer than the typical crib with its bars that could trap a leg and blankets that could suffocate a baby. He could, and did. Proud of his new invention, an enclosed and heated crib with a plexiglass window, he sent an article to the popular magazine the Lady's Home Journal. Changing Skinner's title to grab attention, the article came out as "Baby in a Box". The "baby tender", as Skinner called his crib, was used only as a bed for the new baby. Deborah had a playpen and spent as much time out of her bed as do other infants. But inevitably confusion occurred between the baby tender and the "Skinner Box." To the end of his life Skinner was plagued by rumors about his second daughter, hearing even that she had committed suicide. In fact, Skinner was an affectionate father and never experimented on either of his children. Deborah is a successful artist and lives in London with her husband. When the war was about to end, Skinner attended a dinner party and mentioned to a friend that it was too bad that her son and other young people would come back to the old ways of doing things. She asked what Skinner would have them do instead. Skinner could never refuse a challenge. Almost immediately he began the book Walden Two. Walden Two was written fast, parts with much emotion. In it, a soldier just back from the war, invites friends and his former professor to visit a community called Walden Two, a group of about 1000 members. They go to the community. Its designer, Frazier, explains how the happy and the industrious behaviors they are seeing have been carefully shaped using behavioral techniques. He explains how the competitive urge of parents to favor their own children has been converted to a more equal concern for all youngsters by bringing up the babies communally rather than in families. Both women and men work. Jobs earn work credits weighted so that one can work for only a short time at undesirable jobs or longer at desirable ones. All aspects of the community have been planned. The book, after a slow start, became one of the best known works of Skinner's, receiving both praise and condemnation. In 1945, Skinner and his family moved to Bloomington Indiana where he became Chair of the Psychology Department at the University of Indiana. The field he had started was growing. In 1946 the first meeting of the Society of the Experimental Analysis of Behavior was held in Indiana. Twelve years later, it had a journal, the Journal of the Experimental Analysis of Behavior. An invitation from Harvard University to give the William James Lectures brought Skinner and his family to Cambridge Massachusetts in the fall of 1947. He was invited to join the Psychology Department in 1948. There, he offered to give a course for undergraduates, scrambling each week to produce materials for the 400 students who enrolled. The material eventually became the book Science and Human Behavior (1953). The 1950's and 1960's were productive for Skinner, largely due to the excellent graduate students who came to study with him, including Douglas B. Anger, James A Anliker, Nathan H. Azrin, Donald S. Blough, A. Charles Catania, Lewis R. Gollub, Richard J. Herrnstein, Matthew L. Israel, Alfredo V. Lagmay, Harlan I. Lane, Ogden R. Lindlsey, William H. Morse, Neil J. Peterson, George S. Reynolds, and Herbert S. Terrace. Spinoffs from this work produced the book Schedules of Reinforcement (Ferster & Skinner, 1957), the field of Behavior Therapy (from the work of Ogden Lindsley who coined the term), and psychopharmacology (where Peter Dews at the Harvard Medical School worked closely with Skinner's lab). Skinner's analysis of how to design sequences of steps came to him as he was finishing a book on which he had worked, on and off, for twenty years. Verbal Behavior published in 1957 is an analysis of why we say, write, and even think the way we do. The book is not easy to read. It took another twenty years before researchers used Skinner's categories and found that the different controlling variables he postulated were, indeed, independent. Recently their work has led to breakthroughs in teaching children, especially those with autism, to communicate effectively.